I drive around in my old, beat-up Olds proudly displaying my TEA Party bumper sticker. One day last week a woman comes in to the PO – a daily customer – and says, “RICH! Are you a tea party?” I said, “Sure, want a cup?” She said, “NO, REALLY! Are you a tea party?” I said, “Oh, you mean THE TEA Party? Am I a Tea Party member? Yes, I am. Proud of it.” “Oh,” she said, seemingly very disappointed, “I didn’t think you were like that. That’s not you. Are you REALLY a tea party?” She was obviously shook up. “Yeah, I really am.” “But, they’re the KKK, c’mon, you’re not like that!!! !” I was flabbergasted. “NO! They’re not the KKK. Where did you get that? 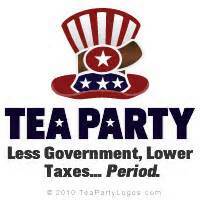 It stands for Taxed Enough Already … limited government. That’s all. Nothing about race.” “Well, OK,” she said sheepishly, “but you’re not like that; it’s not you.” The next day she asked me again, and I had to clarify again. I can tell that she wants to believe me, but can’t … not fully. My question is this: How does one get this impression? Nothing the TEA Party has done reflects this kind of mind-set. Their rallies are peaceful, traditional protests. Oh wait! The MEDIA!!! I forgot about them. Always crying, at the drop of a hat, “RACISTS!” Don’t tell me the media doesn’t affect public opinion. And when that opinion ends up in my face … well, it pisses me off. And that’s my rant of the day. Furthermore … We are a finicky people. We complain about our elected officials and yet we elect them. We tend to stick to party lines, unless epiphany blessedly occurs. We are a finicky people. We complain at the VA, the Post Office, the DMV. We complain of the roads & the bridges. We ask to be provided for, yet we are abhorred when we see the result of the bureaucratic, regulated, red tape. Still, we clamor for more government in our lives. A party comes along – one that is not really a party at all, actually – just a loosely-connected, grass-roots group of Americans that want to re-embrace the Constitution, limit the powers of the federal government, promote individual liberties & freedoms. In effect, address the concerns listed above. But, we are a finicky people. We demonize this party that is not a party. The Taxed Enough Already Party. The one that wants to educate the citizens so that they can claim their God given, government protected rights, so that the media once again takes on its adversarial stance, to force the separation of powers delineated in the Constitution. You know, finicky people … the Tea Baggers. Previous Post: Saint Paddy’s Day! Next Post: A Smell to Remember … What IS that Smell? It isn’t an impression solely invented and maintained by the media, though like any extreme they will exploit and oversimplify it. I’ve read thousands of posts by people self-publishing right here on this platform. No one is controlling what they choose to write. The majority of these articles are outraged screeds full of misspellings, horrible grammar and conspiracy theories, filled with disrespectful insults, written by racist nutjobs. I’m glad you are an exception, but it doesn’t negate the majority.